The average American consumes the equivalent of nearly two teaspoons of salt every day, almost double the upper limit for good health. And before anyone protests about hardly touching the saltshaker, consider: The vast majority of that sodium is hidden inside common foods, from spaghetti sauce to frozen dinners. Now public health specialists are pressuring food manufacturers and restaurants to cut the salt, because too much sodium is bad for your blood pressure — and high blood pressure hurts your heart, brain and kidneys. Reduced-sodium alternatives are rare in grocery aisles. A Food and Drug Administration effort to ratchet down the sodium in some foods the salt-conscious might choose — those labeled "healthy" — has largely stalled. Manufacturers argue it's hard to change the recipe but keep the taste. On one thing do food makers and health critics agree: Making our food supply less salty will require consumer demand, and so far that has focused mostly on trimming the fat. "There's only so much people can worry about when it comes to food," said nutritionist Bonnie Liebman of the consumer group Center for Science in the Public Interest. "But the fact is high blood pressure rates are going up, the evidence that salt raises blood pressure has only gotten stronger, and people need to hear that message." Being overweight and inactive are the major culprits for high blood pressure, but too much salt plays a role, too. The 50 million Americans with hypertension are advised to eat a low-sodium diet, about 1,500 milligrams a day. For healthy people, the government recommends no more than 2,400 mg of sodium daily, the equivalent of a heaping teaspoon of salt. But the average American eats over 4,000 mg a day — three-quarters of it from processed food and restaurant meals, says Dr. Stephen Havas of the University of Maryland. Time-crunched families depend on the convenience of processed foods, so the American Public Health Association, backed by dozens of other health and medical groups, issued a challenge to the industry: Cut in half the sodium in those foods over the next 10 years. "Nobody ever said, 'Do you want that salt in your food?' Somebody put it there for you," says Havas, who wrote APHA's policy. He estimates the change could cut by 20 percent the number of hypertension sufferers, eventually saving 150,000 lives a year. Sodium is used in preserving certain foods, and to pump up other flavors. Other spices can be more expensive, says Gene Grabowski of the Grocery Manufacturers of America. But "taste is the No. 1 reason people buy foods" — and low-sodium brands generally have not sold well, he says. The industry couldn't provide statistics, but there are some lower-sodium alternatives, which FDA regulates. "Lightly salted" peanuts, for example, must have half the salt of regular ones. A food labeled low-sodium, such as low-sodium V8 vegetable juice, can contain no more than 140 mg per serving — regular V8 has over four times more. Stores carry a handful of "no salt added" canned vegetables. For tomatoes, that can save 175 mg of sodium over the regular variety, and 375 mg per serving of canned green beans. Then there are foods labeled "healthy," like Healthy Choice or Campbell's Healthy Request brands. FDA allows no more than 480 mg of sodium in "healthy" soups, compared to canned soups' typical 800- to 1,000 mg. "Healthy" frozen dinners can have no more than 600 mg, far below the whopping 1,500 found in some popular in-a-bowl meals. FDA has long intended to ratchet the "healthy" levels further down, but that effort stalled as food makers, led by Healthy Choice maker ConAgra, argued they haven't yet found good-tasting salternatives — and some lower-sodium frozen-dinner brands quit selling. Consequently, FDA is considering giving soup makers until 2006 to lower sodium levels to 360 mg per serving or lose the healthy label — and letting frozen dinners stay at 600 mg for fear no brands would go lower. As for dining out, the advocacy group CSPI says its testing shows restaurant food can have even more sodium — 3,150 mg in a plate of General Tso's chicken, for instance, and 2,210 in spaghetti with meatballs — partly because serving sizes are bigger. 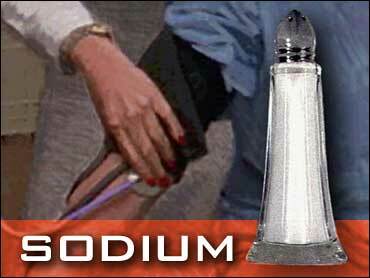 Food companies say they are hunting ways to cut the sodium. The grocery manufacturers' Grabowski notes it took 10 years to cut fat; a low-salt market will take time, too. Meanwhile, sensible sodium means closely checking food labels. "It's of concern for everybody," Havas says. "You don't want to wait until your blood pressure gets into the high range."